We congratulate the chapter of IASWG based in Germany on the celebration of its 25th Anniversary. The anniversary was celebrated in Herzogenrath, on March 15-17, with 100 attendees who participated in workshops and celebratory events. We all send our best wishes to our colleagues in Germany who continue to offer excellent training and support to group workers! New Book! 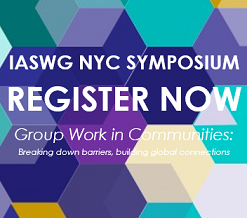 Group Work Stories Celebrating Diversity - Inspired by a dialogue on diversity initiated by the IASWG Board of Directors, Andrew Malekoff, IASWG Board member and revered editor of Social Work with Groups, recently published a book entitled Group Work Stories Celebrating Diversity. (It is also published as a special 40th anniversary issue of Social Work with Groups.). The book includes many entries addressing diversity written by IASWG social group work practitioners, students, and academics. In her recent review of the book, Shantih Clemans, well-respected academic and longtime IASWG member, included these remarks: "With its accessible style, Group Work Stories Celebrating Diversity, also published as a special 40th anniversary issue of Social Work with Groups, is a thoughtful, instructional volume that may spark necessary conversations among teachers and group workers to the beauty and struggles of diversity, in all meanings of the word....As a whole, the 31 essays illuminate powerful, timely, relevant, and often nuanced diversity themes, for example, empathy, self-awareness, and self-understanding, questioning prior assumptions about the world, belonging, connection, and an ongoing search for meaning. As a teacher, I recognized in particular the essays that emphasized critical thinking around diversity, specifically the power and challenges of learning about diversity, as a teacher, student, group leader, or group member...One of the outstanding aspects of this book is the international perspective, which is likely rooted in part to the broad membership of the International Association of Social Work with Groups (IASWG) and among readers of Social Work with Groups. This emerged as a striking departure from the black/white dichotomy of U.S. conversations about diversity and reminded me of the importance of taking a broad and expansive view of diversity in our consideration of human lives and experiences." Read the full review here. Le dossier du travail social de groupe, dans le cadre du projet en partenariat avec l'OTSTCFQ est maintenant disponible en ligne! Allez y jeter un oeil pour voir tout le travail que le comité du Chapitre francophone y a fait pour mettre en valeur l'intervention de groupe en travail social. The International Association for Social Work with Groups is pleased to announce the creation of the Martin Birnbaum Special Projects Fund. The Martin Birnbaum Special Projects Fund will be used to provide funding support for IASWG chapters seeking to produce a special project, as well as for any IASWG event such as an IASWG Group Work Camp being held globally. The Martin Birnbaum Special Projects Fund was created with the generous support of Martin Birnbaum, Professor Emeritus of Social Work and Group Studies at Yeshiva University, and lifetime member of the IASWG Board of Directors. Thank you for wonderful 2018 symposium in South Africa! Join us in Lithuania for the Group Work Camp (October 12 – 14th, 2018). Call for Papers: Groupwork invites you to submit papers that critically address the use of groupwork in all aspects of working with people who have experirenced political oppression. To learn more Groupwork with people who have experienced political oppression, learn more here. Deadline January 1, 2018. Thank you for a memorable 2017 IASWG Symposium. Presenters from the 2016 & 2017 symposia, please consider submitting a paper for proceedings. Tennessee Chapter will present "Multicultural Social Group Work Ethics in Social Work Practice" for a Social Workers Conference at a nearby hospital on October 6, 2017. Annual International Symposium - Thank you for a memorable 2017 IASWG Symposium. Presenters from the 2016 & 2017 symposia, please consider submitting a paper for proceedings. Group work with Pulse survivors inspires UCF professor’s new research in NSM TODAY | After assisting Pulse survivors in a Spanish-mutual aid group, a UCF Social Work professor is now conducting a qualitative study on the factors that influenced the Orlando community’s resiliency following the Pulse nightclub shooting. Associate Professor Olga Molina, along with UCF School of Social Work Director Bonnie Yegidis, will be interviewing social service providers to obtain their perspective on the community’s response to the shooting. In July, Molina and Yegidis will be presenting their findings in Zagreb, Croatia. Molina, who is of Cuban heritage, said she felt directly impacted by the shooting, as most of the survivors and the victims were Latino. “It hit my community,” said Molina. “It also hit the LGBT community, which is a very vulnerable community within the Latino community, and so, I felt that I needed to get involved in helping in whatever way I can.” To read more, click here.